Most visitors are from India. 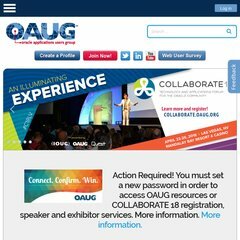 Topics: Advocate To Oracle, Board Of Directors, Councils And Committees, Oaug Staff, and Faqs. Age: The domain is 22 years and 7 months old. The site has about 304 users daily, viewing on average 2.70 pages each. Its 2 nameservers are pdns01.domaincontrol.com, and pdns02.domaincontrol.com. Its IP Number is 64.147.176.88. It is hosted by It Convergence Inc. California, using Oracle-Application-Server-10g/10 web server. PING .itciss.com (64.147.176.88) 56(84) bytes of data. A ping to the server is timed at 46.5 ms, and the average page load time is 1652 milliseconds.